Fettuccine refers to a type of pasta shaped like long, flat ribbons. Indeed, the word "fettuccine" means "small ribbons" in Italian. It is a flat and thick pasta that can be either fresh or dried. 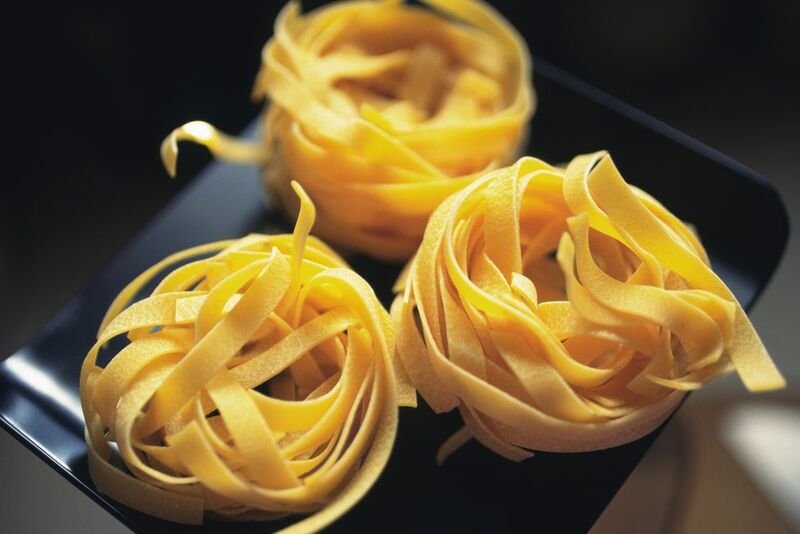 Available in long strands or in curled nests, fettuccine is similar to tagliatelle, which is also a ribbon-style pasta. At about 1/4 inch in width, fettuccine ribbons are just a little bit narrower than tagliatelle, which are about 3/8 inch wide. But they're close enough to be nearly interchangeable. Fettuccine is about twice as wide a linguine, which is usually about 1/8 inch wide. Because it is a thicker pasta, fettuccine is generally served with heavier, meat-based sauces. Fettuccine pasta works best with sauces that are less chunky, as larger pieces of meat or vegetables end up separated from the strands of pasta rather than enjoyed with each bite. Creamy sauces and tomato sauces work well with fettuccine. Fettuccine is made from egg and flour and is very easy to make at home, especially with a pasta machine. Fettuccine is often described as being one of the first types of pasta made, with the long noodles rolled out and hand cut. To make the dough, flour and eggs are worked together, with a little water if needed. Then it is rolled out, either by hand or by the use of a hand-operated or motorized pasta machine, to the desired thickness and cut into strips. Some motorized pasta makers do the complete operation from mixing through extruding and cutting. Artisanal fettuccine may include other ingredients such as spinach, mushrooms, garlic, and herbs to make a flavored or colored fettuccine pasta. You may find bags of fettuccine in various colors and flavors. Sometimes the texture of these varieties will be different from a simple egg and flour fettuccine. As wheat flour is one of the basic ingredients of pasta, those who desire a gluten-free diet can look for gluten-free pasta made with rice flour or other gluten-free flours. Vegans would need to look for a fettuccine that was made without eggs. Dried fettuccine takes 10 to 12 minutes to cook in boiling, salted water. Fresh fettuccine will cook in just a couple of minutes. Fresh fettuccine has a limited shelf life of four to five days beyond its "best by" date, while dried fettuccine can be stored for one to two years beyond its "best by" date. Fresh pasta can be frozen and kept for six to eight months. In the United States, fettuccine alfredo is one of the most popular pasta recipes. Made with a creamy alfredo sauce, fettuccine alfredo can be served plain or sometimes with chicken or shrimp. It is made with cream, butter, parmesan cheese, and fresh ground black pepper. There are many variations that attempt to reduce its calories and eliminate dairy ingredients. Fettuccine carbonara is another popular fettuccine recipe, made with bacon, cream, eggs, Italian parsley, cheese, and black pepper. What's the Difference Between Fusilli and Rotini Pasta?